Have you just discovered a pool of water under your refrigerator? Do you have a leaking appliance? Whether it's under the sink, or behind the washing machine, don't ignore it. Small drips can lead to expensive problems. The accumulation of water seeps behind walls and under flooring. Before long, water damage occurs and often results in growth of mold and mildew. If you notice that you have a leaking appliance, first call your plumber to fix the problem. Then call the dry out experts at Anytime Restoration ASAP. 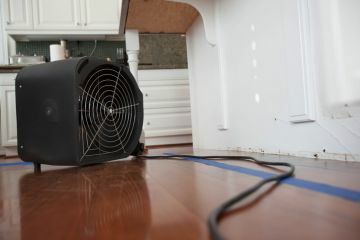 We've been in the business of identifying water damage from appliance leaks and quickly resolving the issue. Water damage accounts for a large percentage of insurance claims nationwide. Small leaks can lead to big problems if left untreated. If water drips from washing machines, dishwashers, or ice boxes, that water is going somewhere! It often runs behind walls and into floor boards, where it pools and causes damage to your drywall, insulation and flooring. When these surfaces are exposed to moisture for over 24 hours, microbial growth begins, and mold spores can spread, causing additional damage to health and expenses to restore. If you suspect an appliance leak, call (612) 254-9542 for immediate service! Anytime Restoration Resolves Appliance Leaks Fast! Because emergency dry out services is what Anytime Restoration does best, we've seen it all. When we get a call for an appliance leak, we take it seriously, because we fully understand the consequences of delay! First, shut off the appliance and the water at its source, if needed. Then call (612) 254-9542 24/7 with a suspected leak or other water loss and you will receive an immediate response. Our dry out crew is standing by and can be dispatched to your home or office in minutes, fully equipped to dry your property and eliminate further damage.